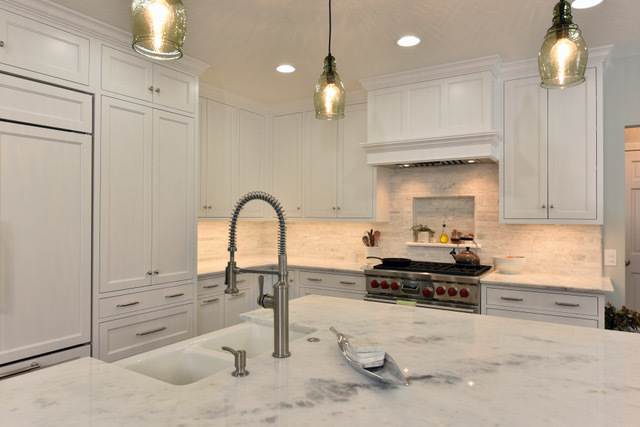 If you’re considering a kitchen remodel, you’ve probably browsed through pictures online or in magazines to get ideas for what kind of style and materials you want. Ever noticed how the kitchens in those pictures just look so…perfect? They don’t show what a kitchen looks like in the aftermath of a family dinner or a Saturday spent baking. The countertops are always spotless and free of clutter, the faucets and sinks flawless, the floors gleaming. If only it could stay that way! Spot-resistant faucet finishes. Although a shiny chrome or stainless steel faucet can really make your kitchen sparkle, you’ll be forever attempting to keep your faucet looking clean. Faucets with spot-resistant coatings are made to conceal water drops, smudges, and finger prints. Keep in mind that these types of coatings may not be able to be cleaned with harsh chemicals or acidic cleaners that can damage the coating, but they are so easy to clean that wiping them periodically with a damp rag is really all you need to keep them looking their best. Scratch-resistant, spot-concealing sinks. Stainless steel sinks are budget friendly and can really make your kitchen shine…when they’re brand new. But give them a few months or years, and you’ll notice that not matter how careful you are, they’ll became scratched. They’re also infamous for showing water spots, and can start to look dull if not cleaned regularly. One of the most durable and easy-to-clean sink options available is composite granite, which comes in a variety of colors. Composite granite is resistant to heat, stains, scratches, and chipping, and it has a smooth, dull coating that conceals water drops. If you prefer a sink that has a nice shine but that doesn’t show water drops as easily as stainless steel, some easy-to-clean options include fireclay, enameled cast iron, and ceramic. No matter what material you choose, undermount sinks are generally easier to clean around than drop-in sinks, since the seam lies beneath the counter instead of above it, making it easy to wipe crumbs from your counters right into your sink. Low-maintenance flooring. The floor in your kitchen probably takes more of a beating than any other room in your house, so to keep it looking its best it needs to be both durable and easy to clean. While hardwood floors are easy to clean, they’re not as resistant to spills and scratches as other materials. Dropped canned goods, plummeting pots and pans, or shattered glass can cause permanent damage to a hardwood floor. If you want the look of hardwood with added durability, a couple easy-to-clean options are wood-look vinyl planks or ceramic or porcelain tiles. Vinyl planks do a wonderful job concealing dirt, and they often have a matte finish that hides smudges and water drops, unlike hardwood floor. Wood-look tiles do have grout, but they can be installed closer together than typical tiles, and less grout means less cleaning. If you prefer a more traditional tile look, large-format tiles are a good option, since larger tiles mean less grout to clean. Other easy-to-clean options that are also budget friendly are linoleum and sheet vinyl, but make sure to choose an option with a matte finish, and select a relatively smooth pattern that won’t require laborious scrubbing to remove dirt from the divots and crevices in the texture. Carefree backsplash. Have you ever tried scrubbing stuck-on food off paint or wallpaper? Not only can it be a challenge, it can take the paint or wallpaper right off your wall if you’re not careful. While satin or semi-gloss paint can stand up to regular scrubbing better than paint with an eggshell or flat sheen, there are better options when it comes to backsplash. Glass tile is one of the easiest backsplash materials to clean, and it has a shine to it that adds a beautiful glimmer to your kitchen. Keep in mind that because of the shine, darker colors do tend to show smudges and fingerprints more than light colors. Ceramic or porcelain tiles have a more matte finish than glass tiles and are also easy to clean, but with any tile, there will be grout to clean. As with flooring, larger tiles mean less grout. If you’d prefer to avoid grout altogether, continuous-sheet backsplashes are an excellent option. They’re available in materials such as glass, quartz, marble, natural stone, or solid surface, and since they’re a continuous, seamless backsplash, they’re a breeze to clean. Middle-of-the-road colors. In any kitchen, extremely dark or extremely light colors can be more of a challenge to clean. For example, white cabinets may not be the best choice for families with kids, since you’ll likely have to regularly wipe off fingerprints and food messes. A shiny black granite countertop might be stunning, but if you’re an avid cook who’s always got some kind of mess going in your kitchen, you may forever be wiping (and drying) your countertop to maintain its streak-free shine. Pull-outs and built-ins. Pull-outs not only make your kitchen more efficient, they allow you to clean your cabinets or pantry easier, since you won’t have to reach into the depths of your cabinets when you need to clean or organize them. Pull-outs beneath the sink are a great way to store cleaning supplies, so that you can easily reach for that sponge or spray each time you need it. Built-ins can help keep clutter such as small appliances, knives, and utensils to a minimum. If you’re considering a kitchen remodel, we can help you select materials that are easy to clean and that will look great for years to come, and we can design your cabinets or pantry with custom pull-outs and built-ins to keep your kitchen clutter free and picture perfect!